Have you ever made gnocchi? If you have, then you might already know that, despite being very rewarding (and NOTHING like the stuff you buy in the shops) it is also quite time consuming to make. However I have found a gnocchi that takes literally minutes to stir together and then to cook. Ladies and gentlemen, I give you ricotta gnocchi. I first found that ricotta could be used in this way in Doña Petrona's book, El Gran Libro de Doña Petrona, where she suggests mixing ricotta, an egg and some flour, along with a pinch of salt, and then boiling the mixture in large dumplings. When I followed her recipe, the mixture was too creamy for boiling - perhaps something to do with watery, supermarket ricotta compared to what she probably used, straight from the cheesemaker. I adjusted the quantity of flour though and it was just right. I'd also advise on making the gnocchi smaller - a heaped teaspoon, just for quicker cooking and also because it looks prettier when serving. These are the fluffiest, lightest little gnocchi you might ever taste - but they're deceiving. You could pack away a fair few of them before you realise they are quite filling after all and need to go and have a lie down. I made a rich and silky tomato and basil sauce to go with them, and sprinkled them with Grana Padano before grinding over some black pepper. Keep a couple of tubs of ricotta in the fridge and you'll always have a home-made, quick dinner up your sleeve. First, get the gnocchi mixture ready. 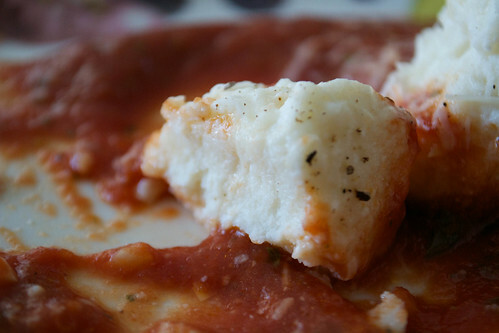 Drain any liquid from the tubs of ricotta and tip the cheese into a mixing bowl, with the egg and salt. Mix well, until smooth, and then add the flour, mixing for a second time. You should have a mixture the consistency of thick mousse - you'll be able to pick it up with a spoon and it'll hold it's shape. If not, add a teaspoonful more flour. Put a large pan of salted water on the heat. While that's heating up, make your sauce. Fry the garlic very gently in olive oil with a pinch of salt, until softened but not coloured. Tip in the passata, the sugar and the basil and bring to a simmer. Taste, adding salt and pepper to season. 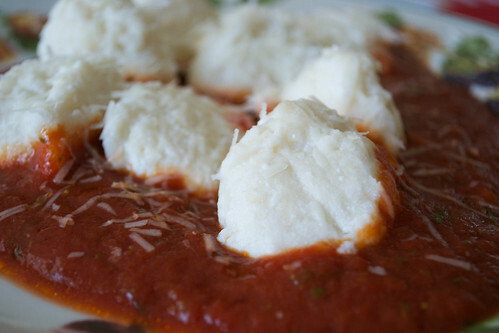 Turn the sauce right down to keep warm while you cook your gnocchi. Take a teaspoonful of the mixture and push it off with another spoon, directly (and carefully!) into the boiling water. Repeat, until you've used up about half of the mixture. As the gnocchi rise up to the top, lift them out with a slotted spoon and drain them well. Continue with the rest of the batch. Once the gnocchi is cooked, serve with the sauce along with black pepper and Grana Padano or Pecorino for grating over.